You’ve heard the claims. “You can generate a 300 percent return on investment preserving your roads!” “Your investment in road preservation will double the service life of this pavement!” I’ve made them myself. Long view of one of three test sections in 2017. Close-up view of a second of three test sections in 2017. But bold promises such as these can be hard to prove, even when the track record of the company performing the work stretches back nearly 50 years. That’s why, when a state-of-the-art technology comes along that can independently validate real-world road preservation, there’s good reason for excitement. I’ve been in the asphalt business for more than 20 years, and when first introduced to 3D imaging technology, I couldn’t believe what I was seeing. When you learn about the innovative technology this article will introduce you to, I’m confident you, too, will see road preservation work in a new light. As with many assets, an asphalt road seems to deteriorate in slow motion, picking up speed about 12 to 14 years into the pavement’s service life. Common sense tells you that proactive preservation will extend the life of pavement, the same way it does with other more familiar aspects of our lives. We all brush our teeth regularly, right? Intuitively we know it’s the right thing to do for a healthy mouth and the long-term performance of our teeth. And in the case of dental health, there is lots of solid research to validate what we intuitively know. Well, roads are not so different. With nearly 50 years of working with maltene-based asphalt rejuvenators, we’ve learned three big things. But until recently, obtaining the evidence to validate these things has been challenging. “Why treat a one-year-old road? We just paved it!” We hear this all the time. To answer that question, prior to the introduction of 3D imaging technology, a typical “proof” scenario worked like this long-term study we conducted for Hillsborough County, Florida. The first road was paved in 2003. One year later, in 2004, we applied a maltene-based rejuvenator on three test sections. Then we began monitoring them in one-year increments. In 2005, it was apparent to the naked eye that the untreated lane was experiencing more aging than the treated lane. By 2017, the visual difference was quite dramatic, as shown on page 64. Even the other two roads that were treated four years and eight years after paving respectively showed improvements beyond our expectations. Although rejuvenation can help roads that were paved as long as eight years prior to treatment, these photos demonstrate the sooner the better for long-term performance. So yes, even before 3D imaging technology was available, it was visually apparent that the first secret to road preservation is to start before deterioration begins to occur. Waiting to apply the rejuvenator is not as effective: hence, the earlier the better. Time and time again, after nearly 50 years of preservation experience, we’ve seen visual evidence of rejuvenation working on all different kinds, types, and ages of asphalt roads. But even when traffic and wear conditions make it impractical or impossible to “see” the difference, there has historically been another way to independently assess the results. Testing the hardness (viscosity) of the asphalt binder (“glue”) reveals the degree to which the pliability restored by rejuvenation sustains over time. 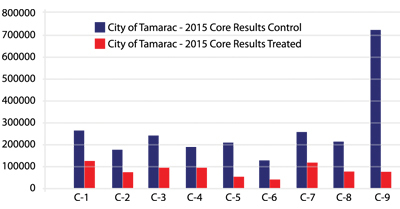 In this graph from a project in Tamarac, Florida, the blue bars show how “hard” the asphalt was before rejuvenation, and the red bars indicate the degree of “hardness” post-treatment. The results show 50 percent, 60 percent, and even in excess of 70 percent reductions in the stiffness or hardness of the “glue”! Clearly, even when a visual difference is not seen, the hardening of the asphalt is greatly reduced when properly rejuvenated—and just as with your arteries, that pliability ensures a longer life! Unless rejuvenation is actually prolonging service life 10, 15, and even 20 years down the road, why do so many public agencies treat their roads so early? Would you rejuvenate your pavement if the results were not only a better-looking road, but also a smoother and longer-lasting road? Until now, conducting a real-world pavement study of that duration has been a challenge. But today, in 2018, we finally have a technology that unlocks the mysteries of the pavement universe. We can now use high-resolution, high-speed 3D imaging equipment with millimeter accuracy to perform state-of-the-art testing of life-cycle performance. 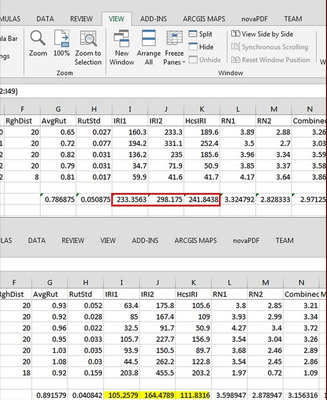 Using a measurement called the International Roughness Index, ICC shows roughness on the treated section highlighted in yellow that is less than half the untreated section bracketed in red (kinda like golf, lower scores are better). Wouldn’t we rather have smoother roads in America? We certainly don’t need any rougher ones! 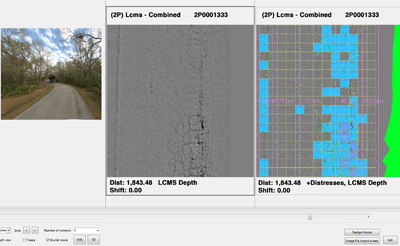 These two images show the pixel or tile data from the 3D imaging equipment. The tiles show areas of distress in the road; the green represents the edge of pavement or gutter pan. Blue tiles are high-severity pavement distress. In the treated section above on the right, after 14 years the number of blue tiles is significantly lower, demonstrating much lower roughness in comparison with the untreated section on the left. This data provides objective evidence of long-term performance after only one treatment of the maltene-based rejuvenator all the way back in 2004. 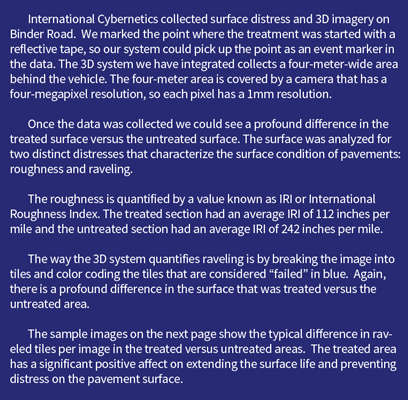 In two separate types of state-of-the art testing, International Roughness Index and 3D raveling imagery, the long- term performance of maltene-based asphalt rejuvenation has been shown conclusively using independent testing procedures. In the field, with visual evidence. In the lab, with the change in chemical properties (hardness). And now, with a technology of the future that reveals dramatic service life improvements in smoothness and longevity. This is proof positive that by investing a small amount of money early in the life of their roads, private communities can save significant dollars over the long term! Asphalt preservation with a maltene-based rejuvenator provides the kind of return on investment the stock market would envy. Clearly, what was old can be new again! Chris Evers has served as a technical representative for Pavement Technology, Inc. since 2011 and has been involved in the road building business since 1996. He is a past president of the APWA Florida Chapter and an active participant on its Legislative Affairs committee. He founded and continues to moderate the annual APWA International Public Works Director Roundtable and was also instrumental in founding the Florida Pavement Preservation Council. Chris is a popular pavement preservation educator/speaker throughout Florida and resides in Vero Beach. For more information on Pavement Technology, visit www.pavetechinc.com or contact Chris via info@pavetechinc.com.